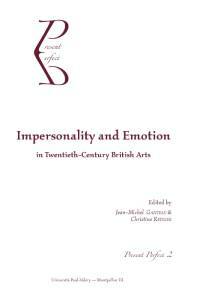 This volume comes as a sequel to a previous publication, Impersonality and Emotion in Twentieth-Century British Literature, which explored the paradoxical connections between impersonality and emotion, two notions central to modernist as well as to later British literature. Through the double prism of impersonality and emotion, the first set of articles presented here bring to light if not the tenets of Modernism, at least some of the aesthetic principles of representative artists of the time and, from Beardsley to Hitchcock through Windham Lewis, Gaudier Brzeska and Epstein, browses through various forms like drawing, architecture, film and the radio play. The second half of he volume concentrates on the post-war period, addressing the vexed question of the relationships between impersonality and emotion in film (Antonioni), drama (Bond), photography (Brandt, Almond), painting (School of London), architecture, and other types of contemporary manifestations and installations practiced by the Young British Artists and their contemporaries (Hirst, Taylor-Wood, Floyer, Whiteread, Opie among others). The twenty two articles in this collection unearth lines of force that run all the way from romanticism to postmodernism. While stressing the unexpected perenniality of the impersonal, they give the lie to Fredric Jameson’s famous vision of contemporary literature as characterised by a ‘waning of affect’. 2006, 16 × 24 cm, 15 €, 276 p., dos carré collé, ISBN 2-84269-751-1.